2 Bedroom Flat For Sale in Wadhurst, East Sussex for Asking Price £995,000. This award-winning property is the jewel in the crown of this fabulous Manor House. 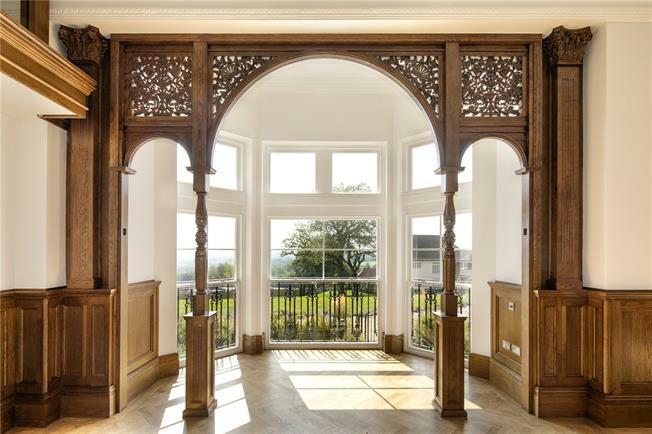 Spread across the ground floor of the Manor House, the luxurious Ballroom apartment is finished to the highest standards, with exquisitely restored ceilings, ornate wood carvings and all the conveniences of modern living. At the heart of the apartment, the open-plan living area is Ideal for entertaining with its formal lounge and dining area, with large bay windows and a fully fitted kitchen complete with a central island. For informal lounging, the mezzanine level makes for an ideal TV area, and for those wanting a study or office, a spiral staircase leads up to the minstrel’s gallery, which makes for a perfect secluded workspace. Lighting the vaulted ceiling, a 15ft chandelier brings an extra level of grandeur to the apartment. The Ballroom owes its period splendour to the extensive history of the 19th century Manor House. Built for John Bruce, a descendant of Robert the Bruce, the manor was designed by renowned architect Adolphus Croft, who captured the Domestic Revival and Queen Anne style with ornamental redbrick façades, oak joinery and stained-glass windows. Upon the Manor’s completion in 1885, the property directory stated how ‘the residence has an interior which is admirably appointed, and no expense whatever has been spared.’ Between the early 20th century and the turn of the millennium, the Manor House became a boarding school for girls and then a home for the Legat Ballet School, before the building closed in 2001 and sadly fell into disrepair. In 2015, Newcourt Residential took on the restoration project and are proud to have brought this iconic building back to its former glory.